What can Robert Herjavec, the star of ABC’s Shark Tank and successful serial entrepreneur who now runs the computer security company Herjavec Group, tell you about Zbjeg, Croatia–the small town in which he grew up? “This is how out there it is,” he told attendees at Inc. and CNBC’s iCONIC conference in Seattle on Tuesday. “The word actually means ‘escape.’ I grew up in a village people escaped from.” Escape he did–or rather his parents did, taking a eight-year-old Robert from a dirt-floored home to seek a better life in Toronto. Herjavec–sharply styled in a light blue jacket, tan pants, and a generously-collared white shirt–told attendees at the conference his life story, more or less. It’s a tale that’s all but made for the movies. Still, his pride during the Olympics from being able to wow women at Sarajevo bars by saying he was a producer was severely dinged, he said, when he got back home and was unable to find any work. He got the job by working for free, after extracting a promise that, should he learn the business after six months, the founder would pay him retroactively for that time. 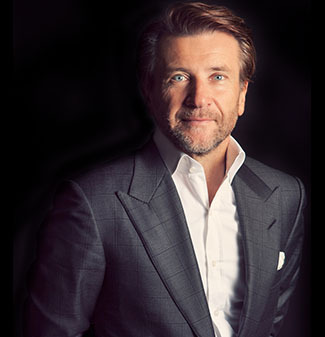 Faced with the quotidian challenge of needing to pay rent while not drawing a salary, Herjavec waited tables at night after working all day at the computer company. An increasing interest in entrepreneurship made Herjavec famous–first via the Canadian TV show Dragons’ Den, then on the American version Shark Tank–but, when asked onstage by Inc. President Eric Schurenberg if he felt that we’re in a golden age for starting businesses, Herjavec demurred. “This is a great time to start a business,” he said, “but two things make it really tough.” The first is that the democratization of information has made it harder to have an informational edge over customers and suppliers. The other is how competition has intensified, because so many factors make it cheaper than ever to start a company.